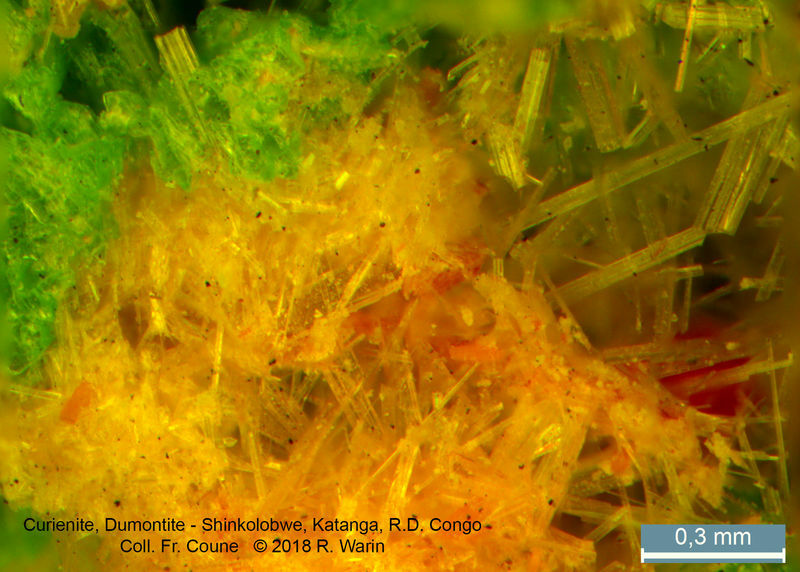 FMF - Friends of Minerals Forum, discussion and message board :: View topic - Minerals of DR Congo, Katanga. 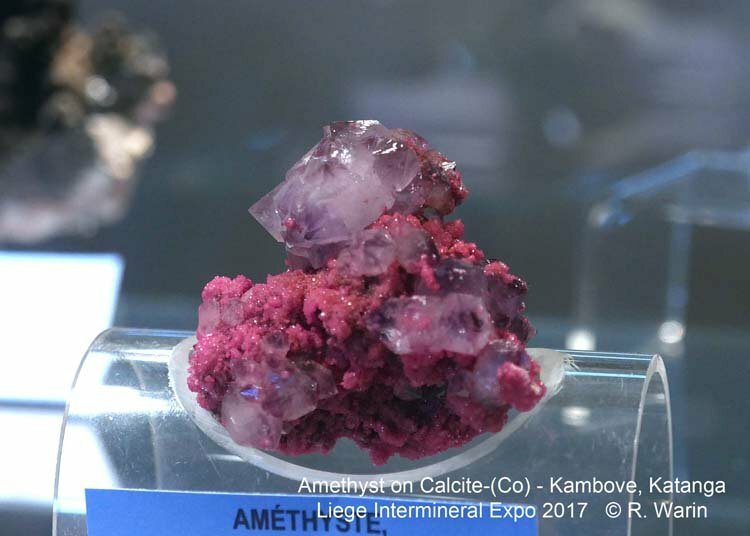 Posted: Dec 07, 2017 01:22 Post subject: Minerals of DR Congo, Katanga. 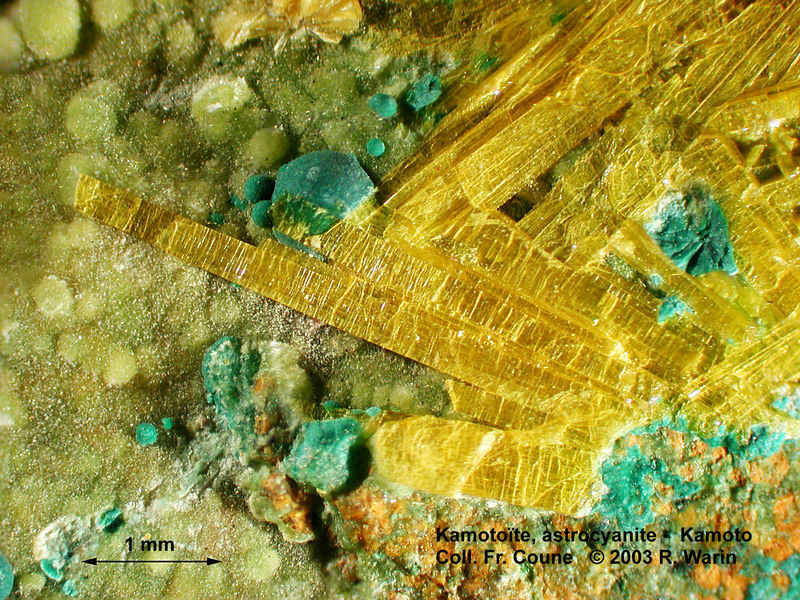 About the copper-bearing crescent, referred to as the South Katanga geological scandal. 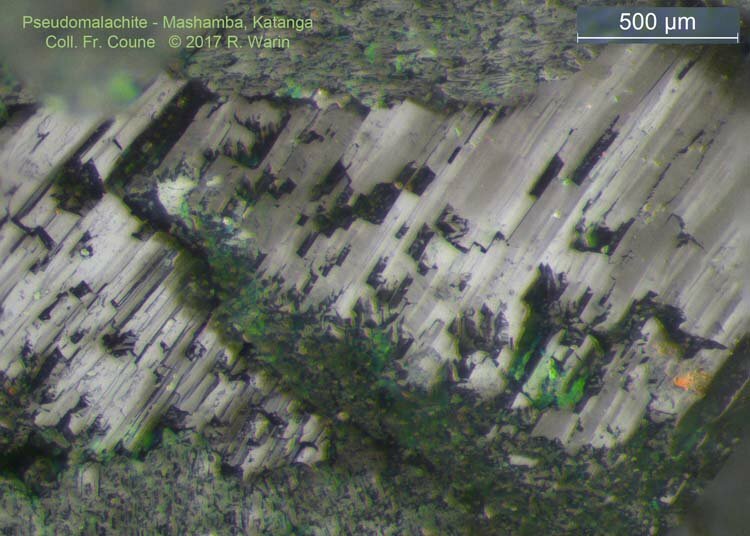 Mining centers: Shinkolobwe (U), Lubumbashi (Cu), Likasi (Cu), Kambove (Cu, Co.), Kipushi (Zn, Cu, Ge). 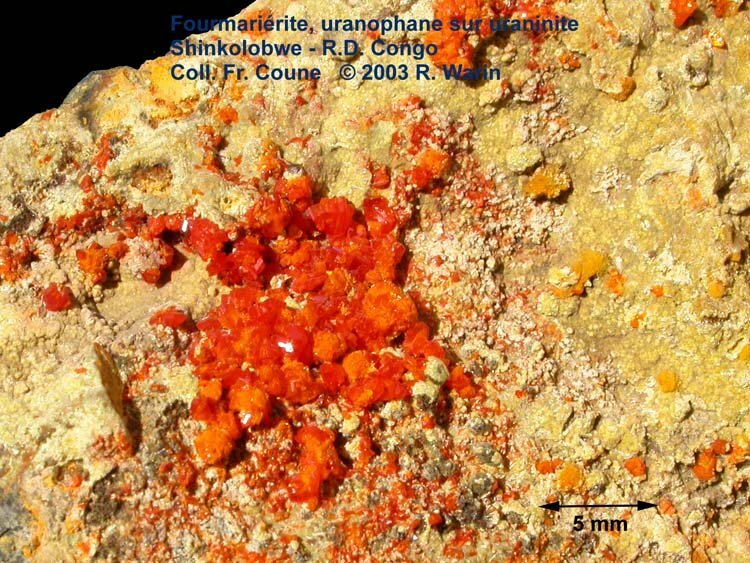 Posted: Dec 08, 2017 10:45 Post subject: Re: Minerals of DR Congo, Katanga. 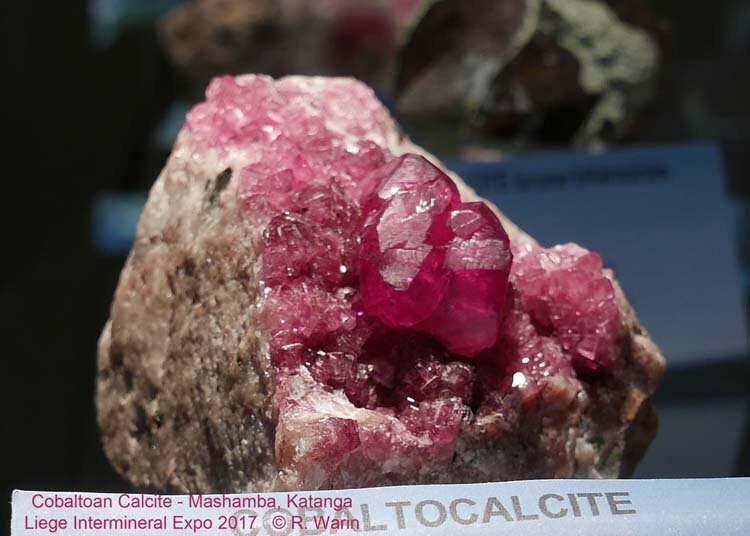 Posted: Dec 08, 2017 11:01 Post subject: Re: Minerals of DR Congo, Katanga. 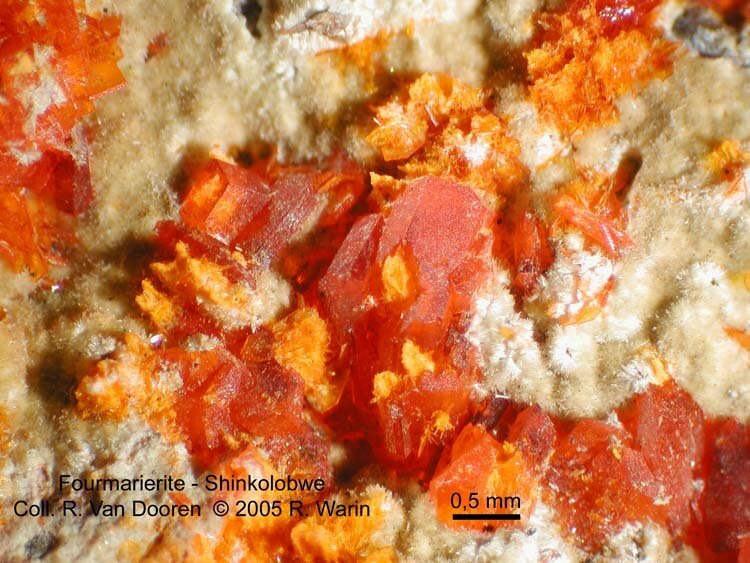 Dewindtite - hydrated phosphate of uranyl and lead. 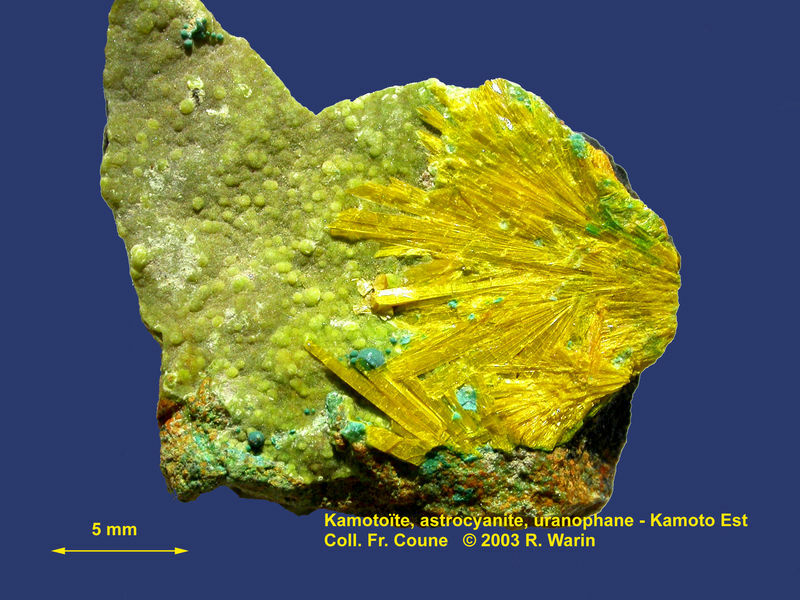 Posted: Dec 09, 2017 15:38 Post subject: Re: Minerals of DR Congo, Katanga. 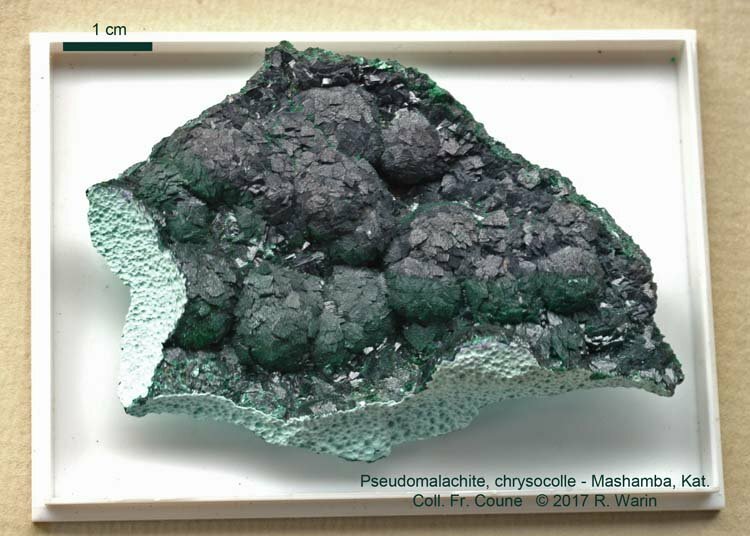 Pseudomalachite: Cu5(PO4)2(OH)4 on chrysocolla, Mashamba, Katanga. 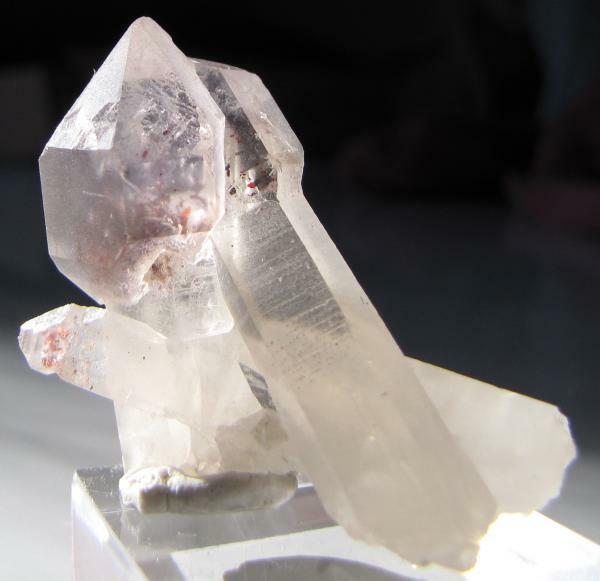 Monoclinic crystals of pseudomalachite are very rare in Congo. 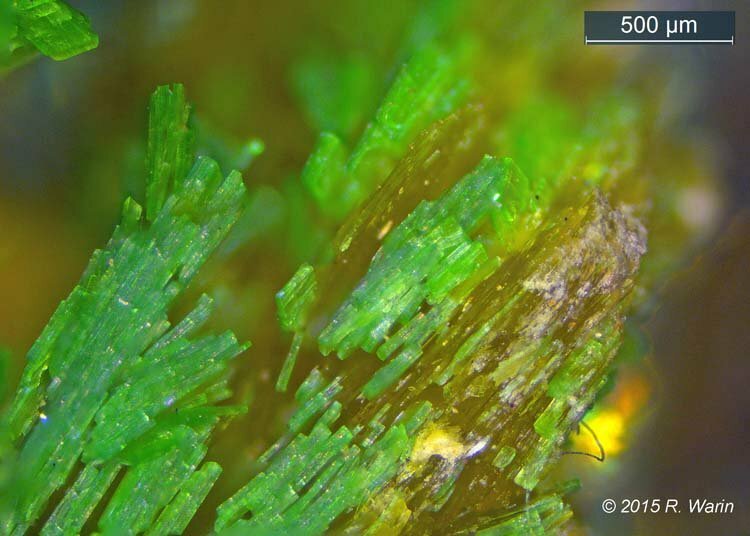 The macrophoto shows well the hillocky appearance, dark green to dark gray. 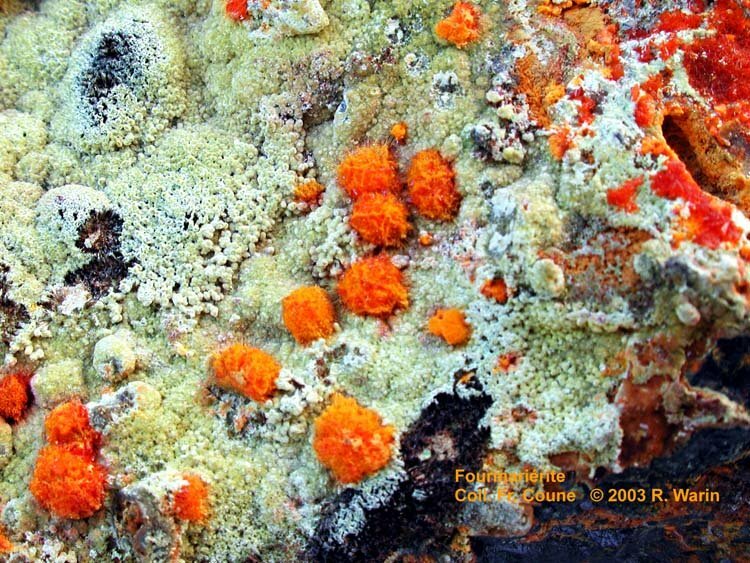 Under the microscope, the fine texture appears. 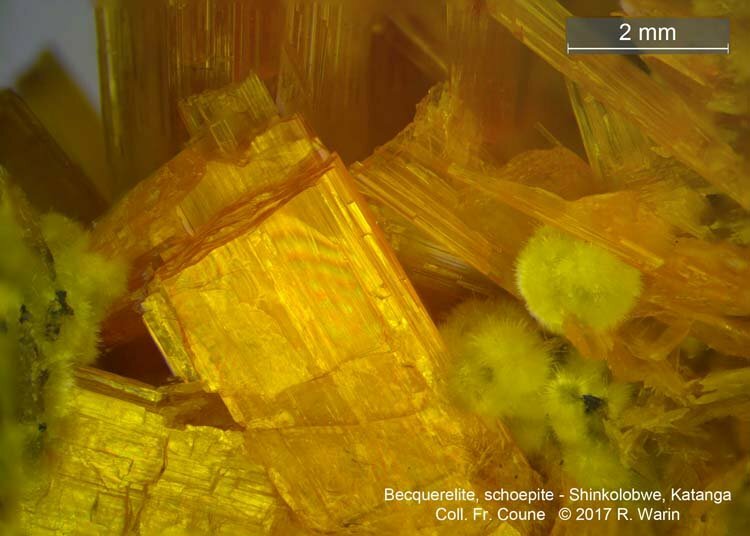 Aggregates of acicular crystals, reflective laterally. Gray tint. 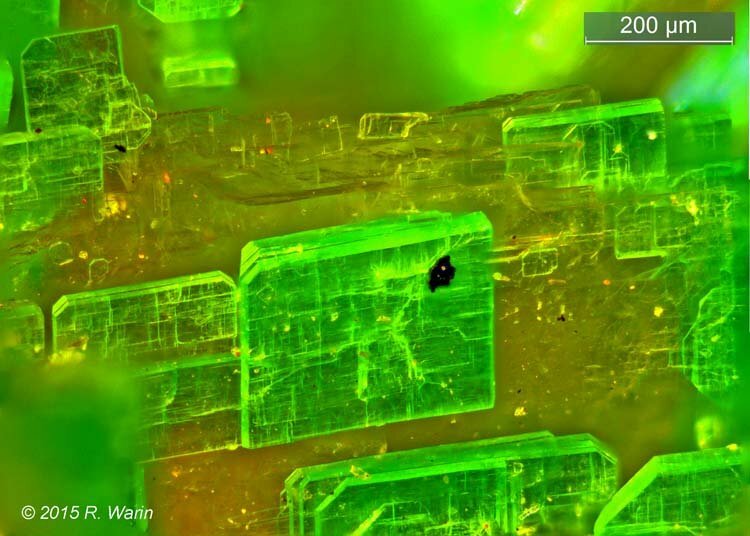 Some parts, whose green colored ends, would correspond to late elongation or secondary growth of pseudomalachite microcrystals. 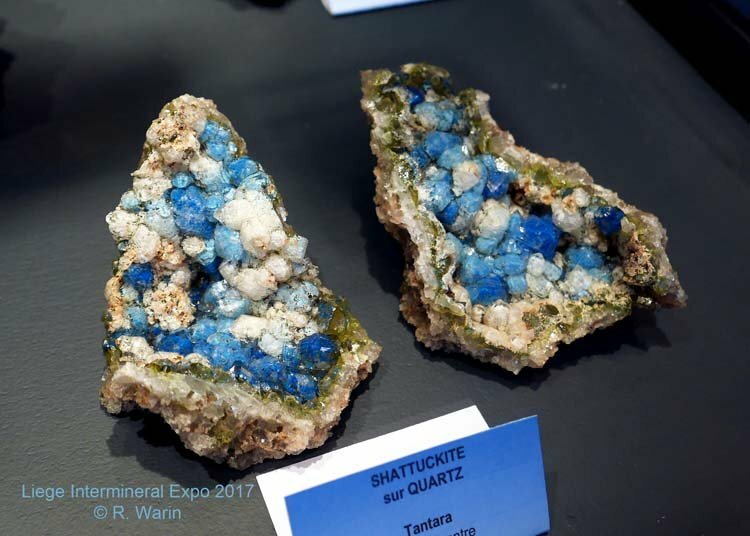 Posted: Dec 11, 2017 09:40 Post subject: Re: Minerals of DR Congo, Katanga. 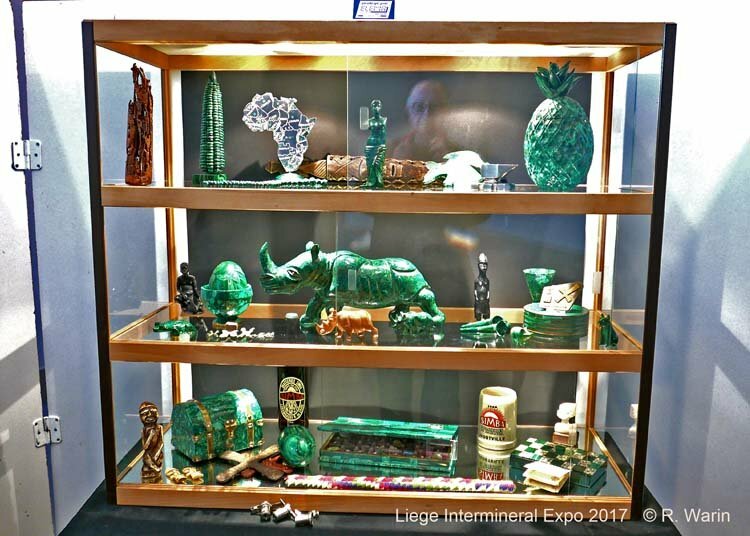 Liege Intermineral Expo 4-5 November 2017. 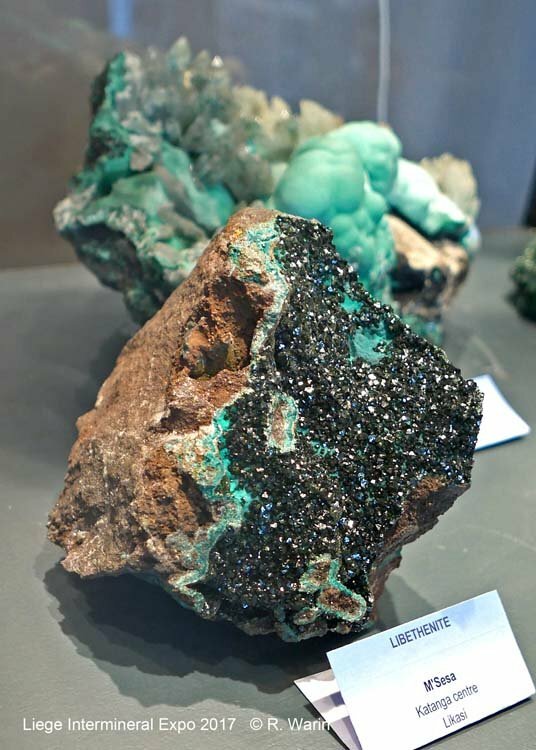 National Museum of Natural History of Luxembourg, Dr. Simon Philippo. 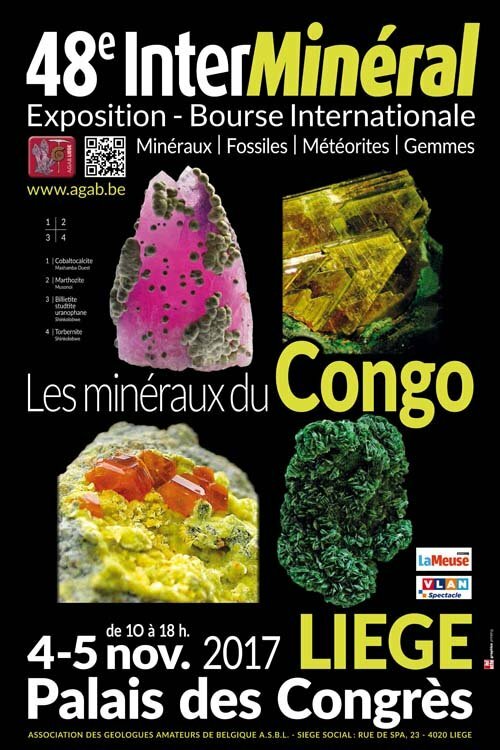 Laboratory of Mineralogy - University of Liege, Prof. Frédéric Hatert. 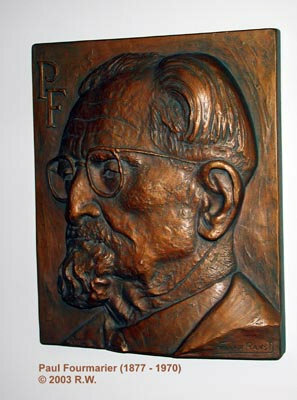 Francis Coune and Valère Berlage. 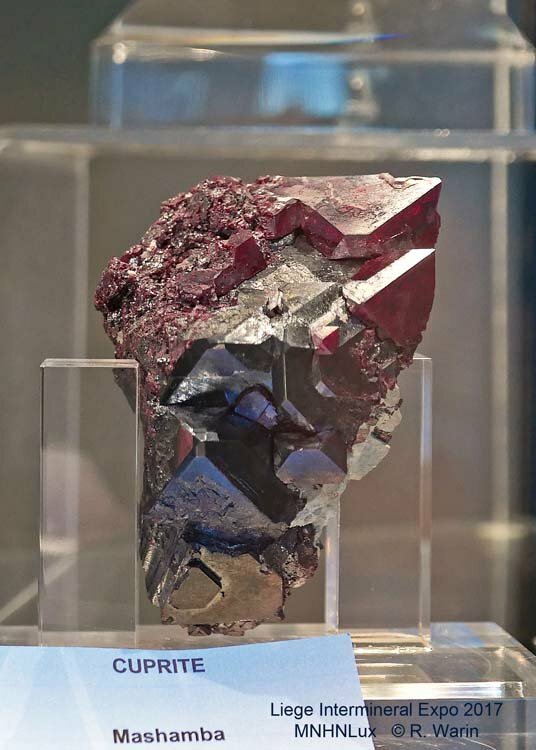 Rare and nice specimens were presented. 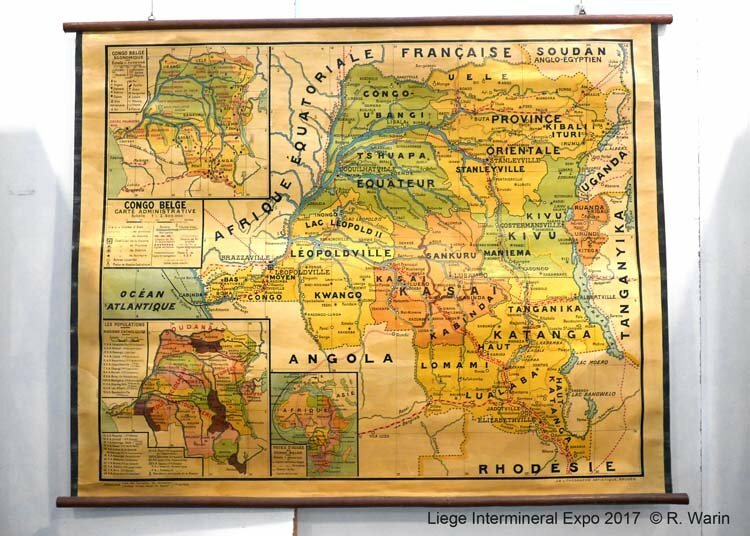 Geography as it was taught in the 40s-50s. 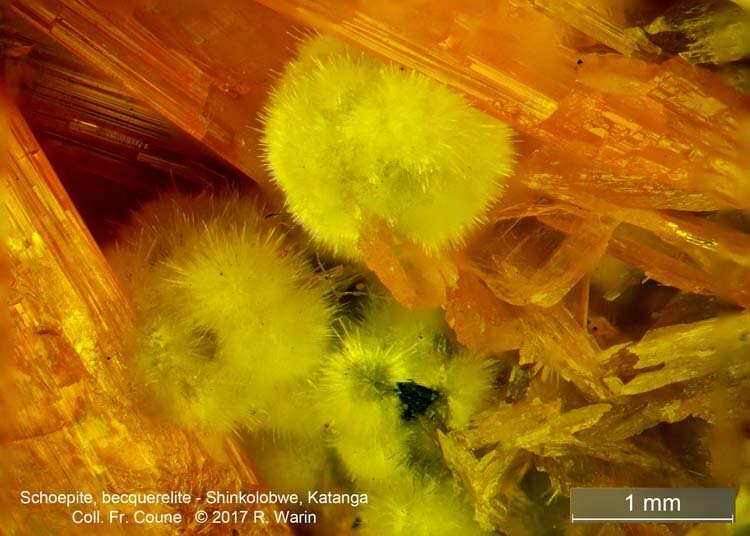 Posted: Dec 13, 2017 13:53 Post subject: Re: Minerals of DR Congo, Katanga. 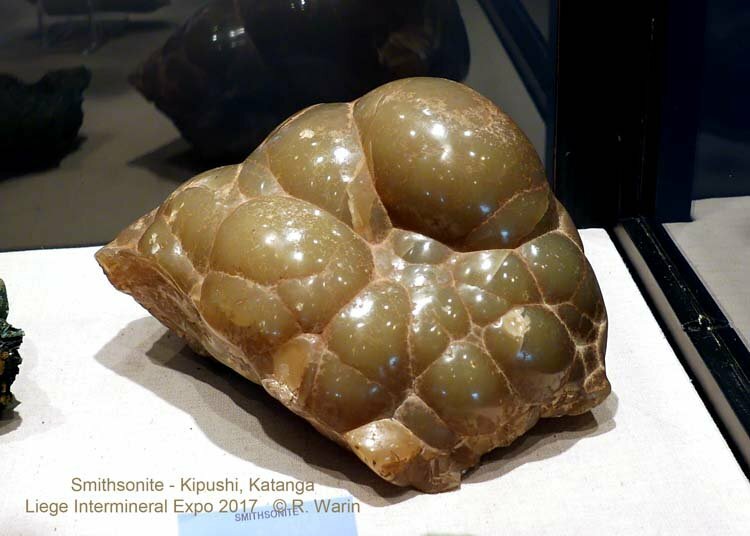 Posted: Dec 13, 2017 15:58 Post subject: Re: Minerals of DR Congo, Katanga. 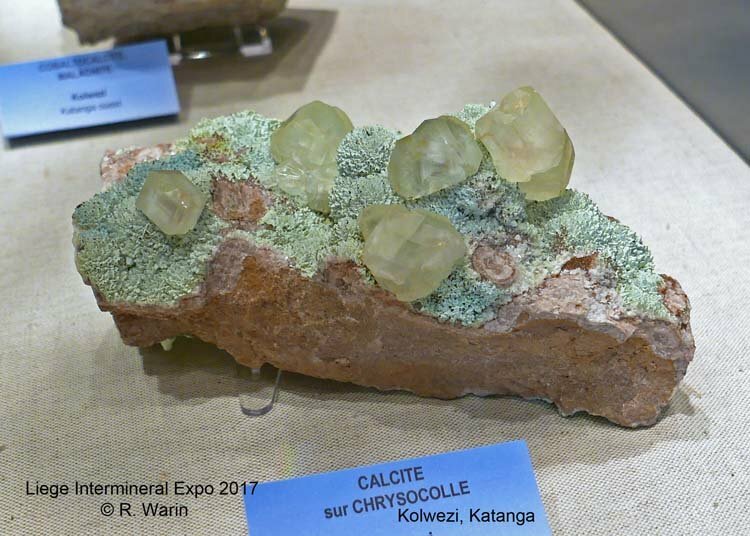 Posted: Dec 14, 2017 22:46 Post subject: Re: Minerals of DR Congo, Katanga. 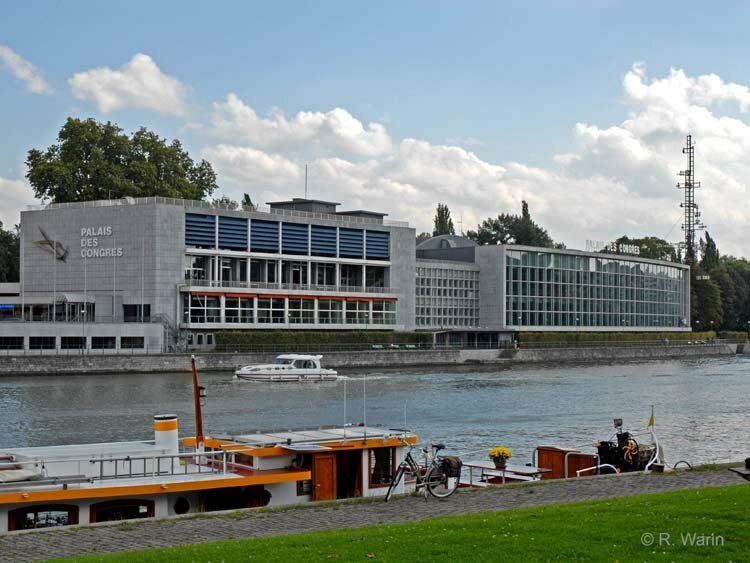 University of Liège, inventor of microtectonics. 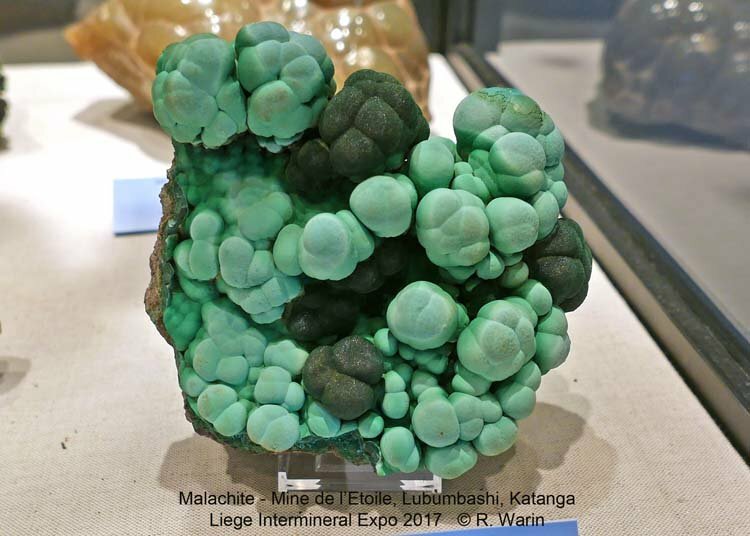 Posted: Dec 16, 2017 09:45 Post subject: Re: Minerals of DR Congo, Katanga. 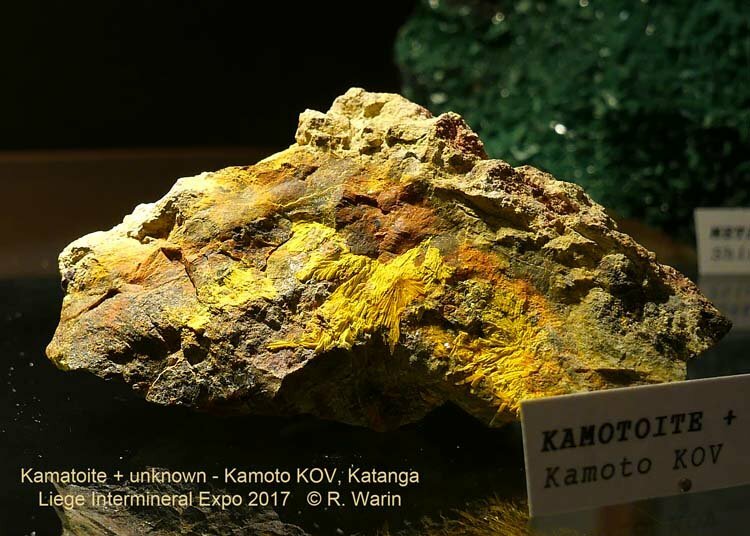 Posted: Dec 16, 2017 11:45 Post subject: Re: Minerals of DR Congo, Katanga. 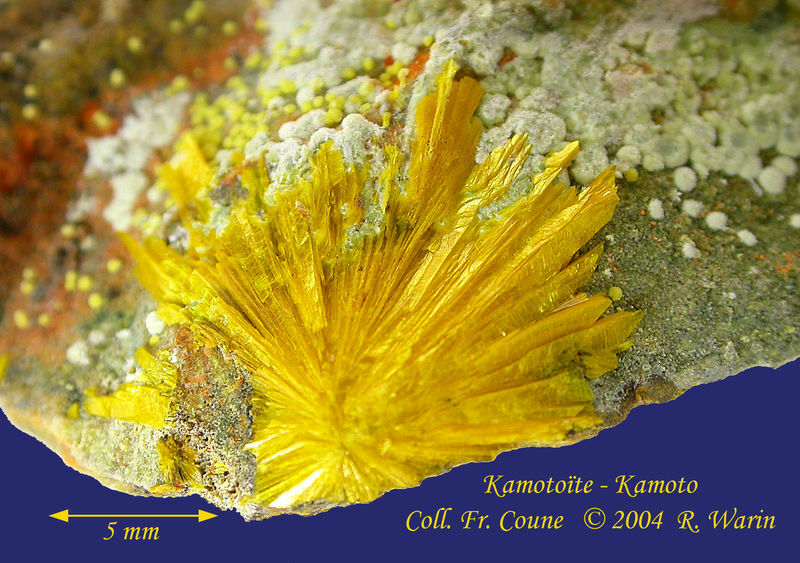 Kamotoite, Kamoto East Open cut, Kolwezi, Katanga. 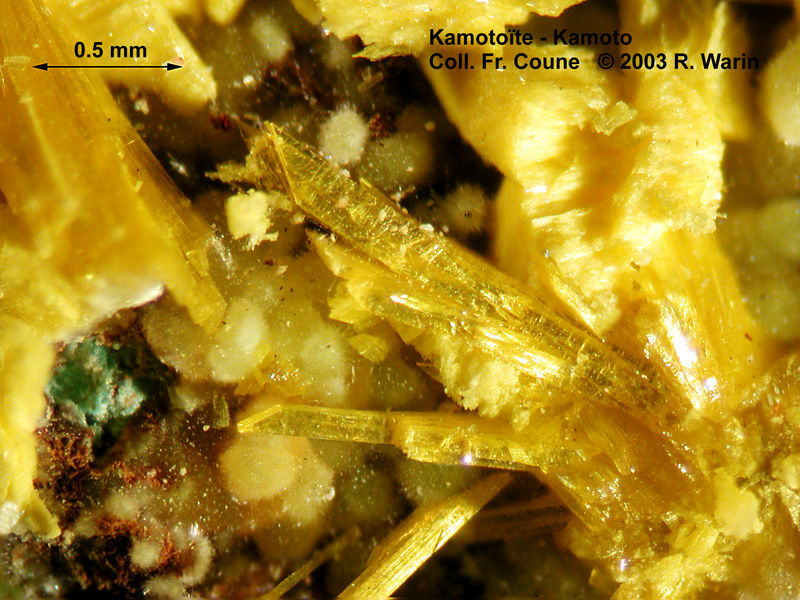 Relatively recent mineral, described in 1986 (Deliens and Piret). 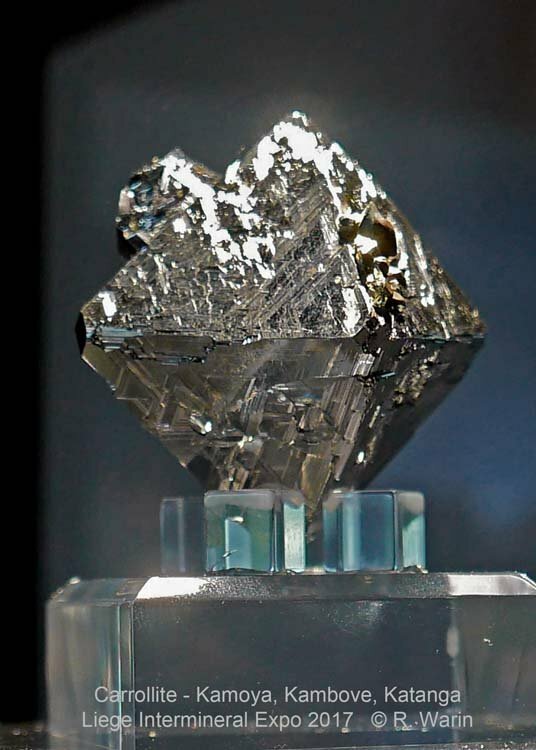 Hydrated Carbonate of Uranyl and Rare Earth. 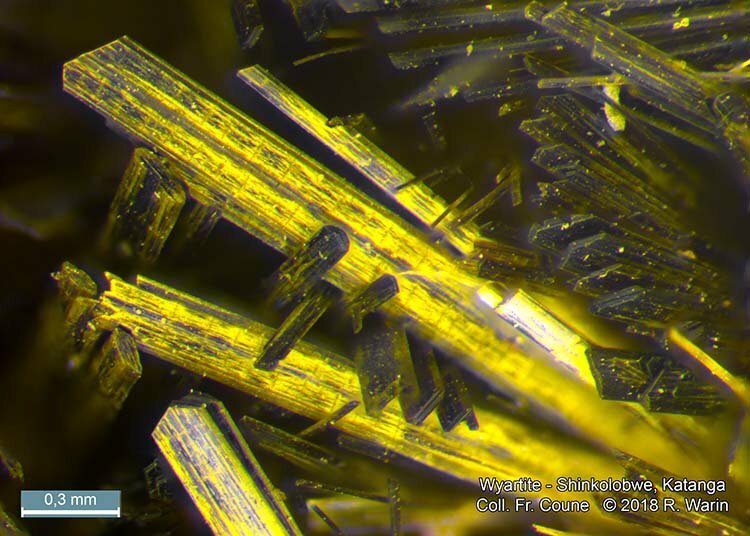 Transparent slats of lemon yellow color. 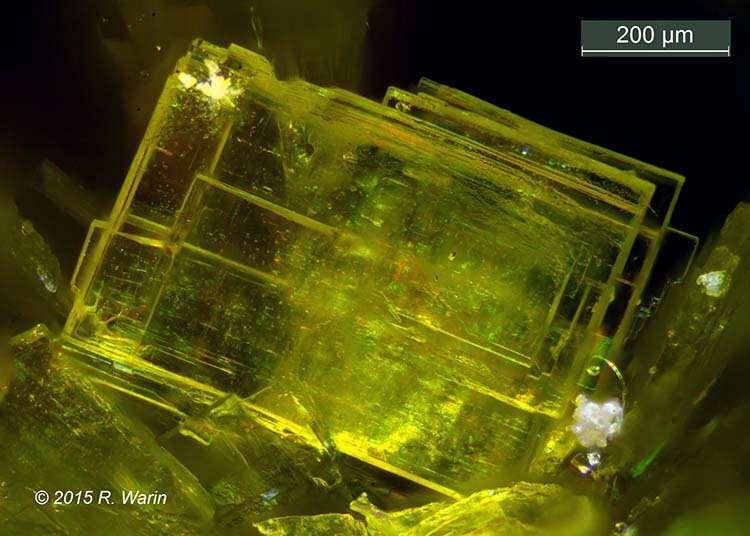 Tip termination, 35 ° angle. 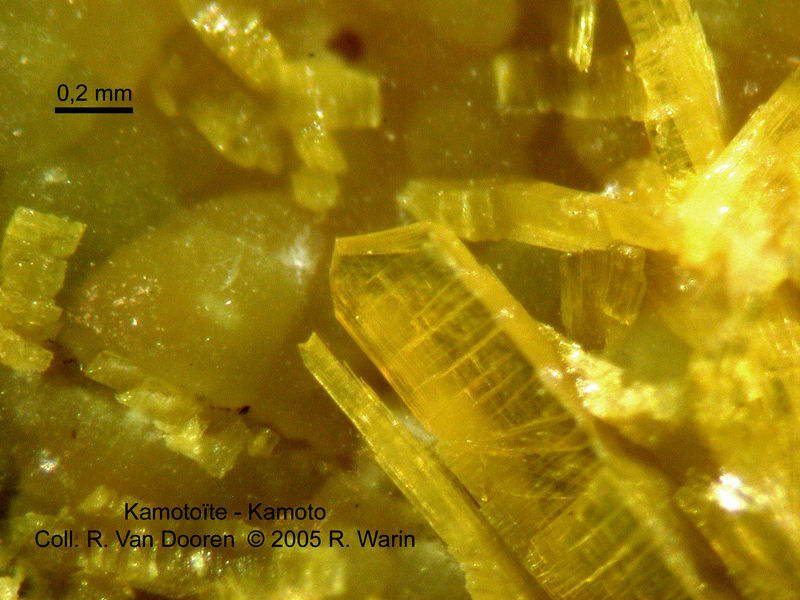 Dehydrated, the kamotoite becomes opaque. 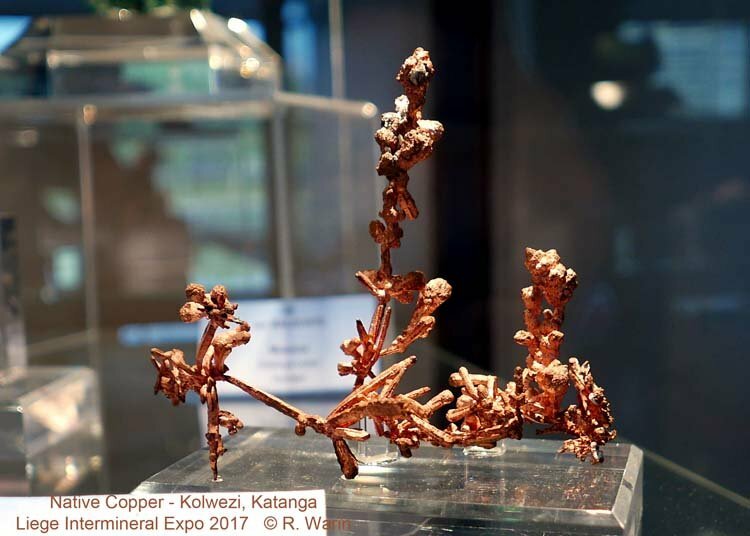 Posted: Dec 16, 2017 15:06 Post subject: Re: Minerals of DR Congo, Katanga. 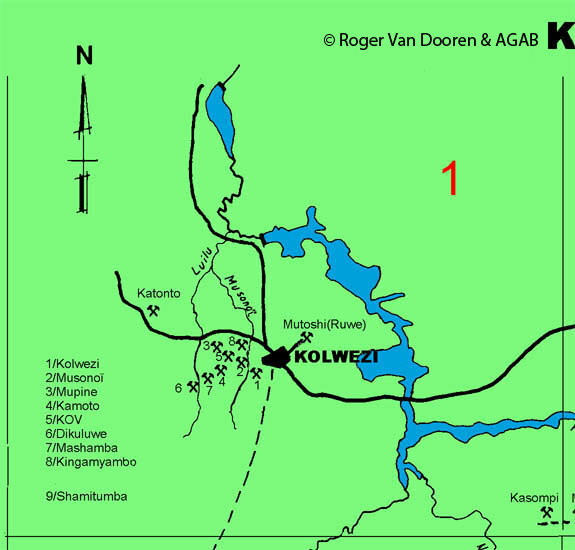 It may be useful to locate mines on a map of Kolwezi area, Katanga. 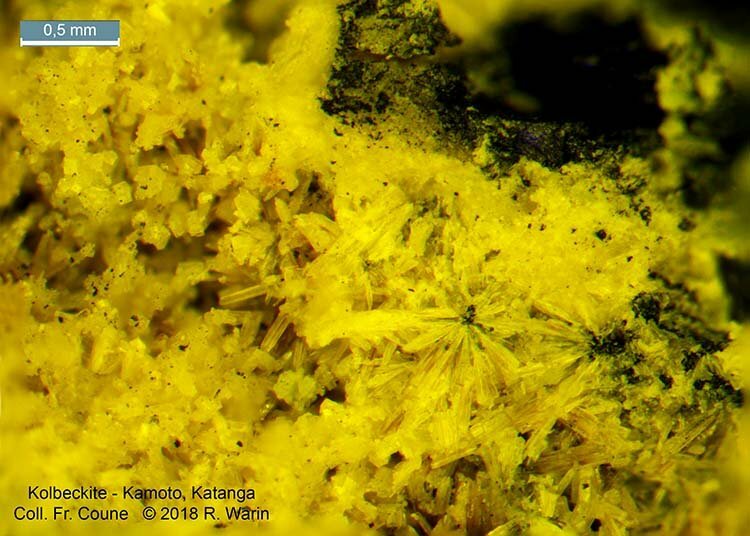 Posted: Feb 12, 2018 05:51 Post subject: Re: Minerals of DR Congo, Katanga. 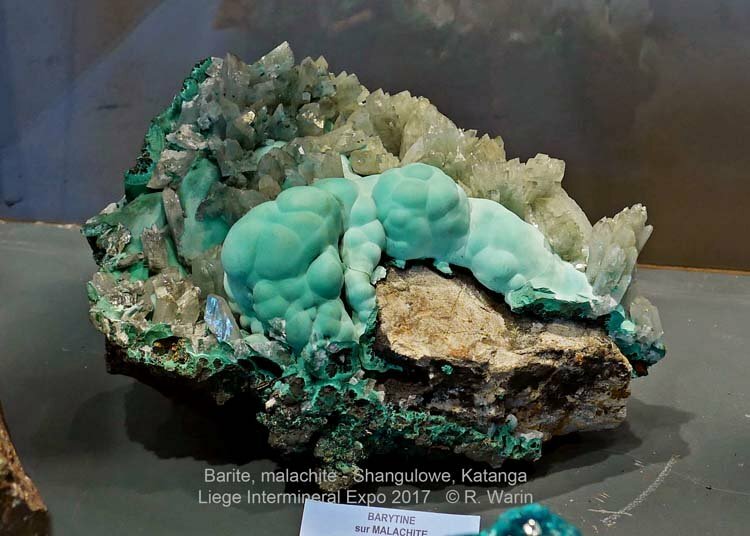 It's time to show you some rarities from Katanga (Shinkolobwe). 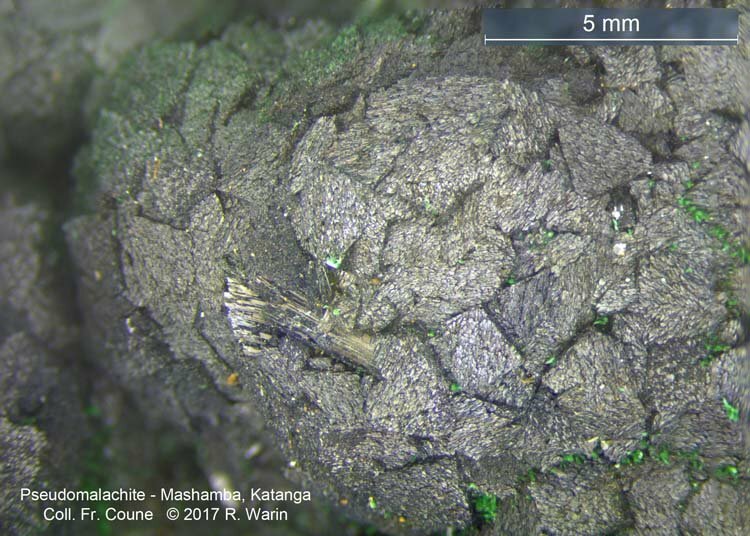 The first specimen is 1 cm wide. 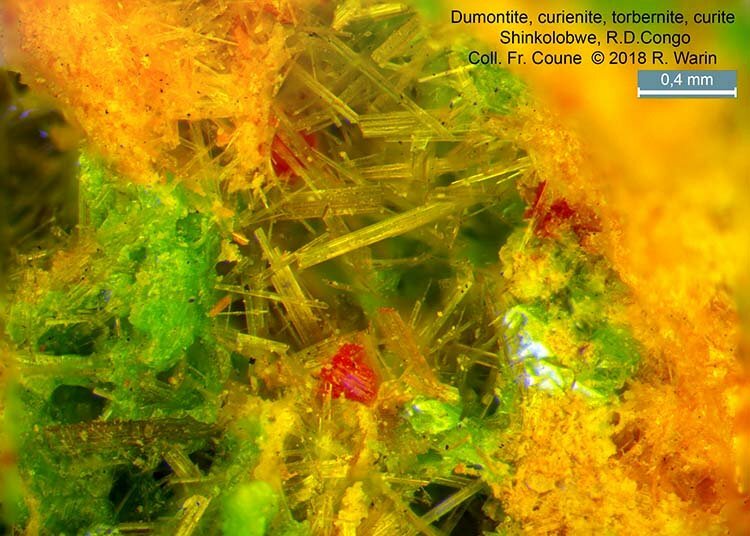 We find on a background of poorly crystallized torbernite, tan needles of dumontite, red curite and geld curienite. 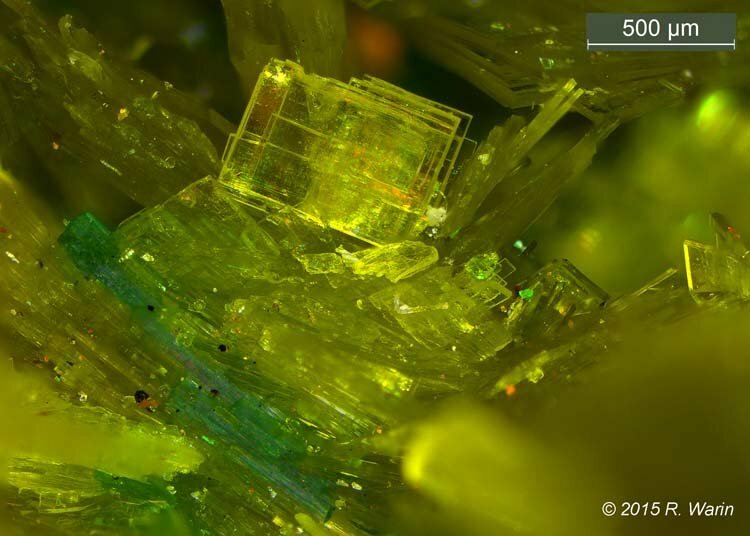 FOV = 3 mm. 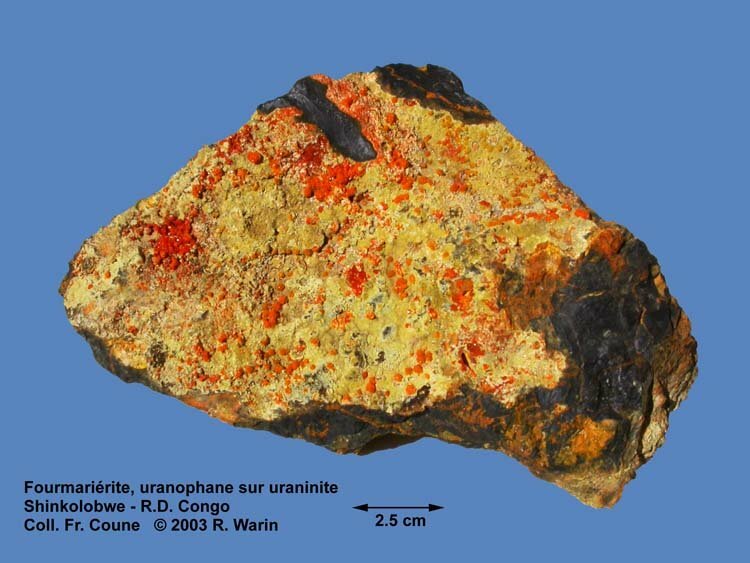 This is the only sample on which the curienite was analyzed in Katanga. 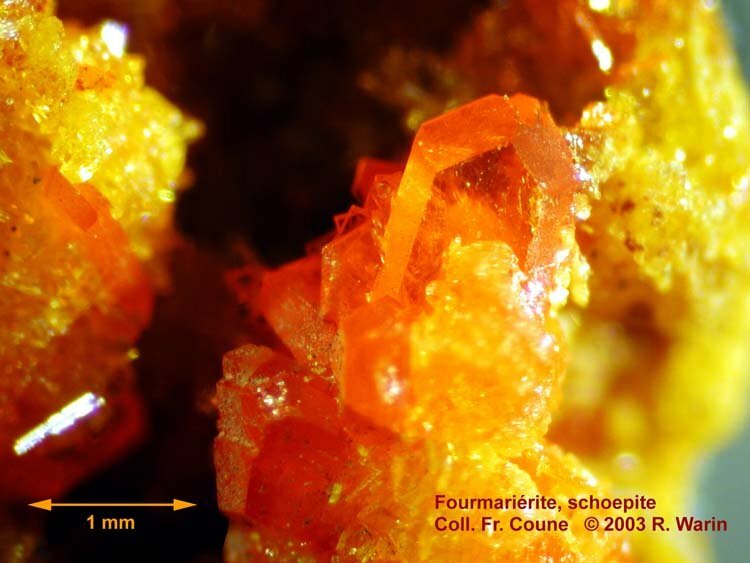 This mineral is normally found in Mounana, Franceville (Gabon). 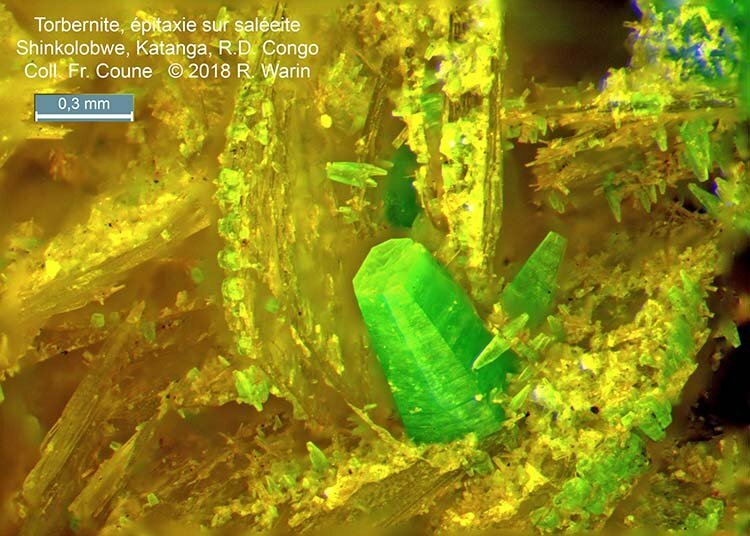 Posted: Feb 16, 2018 00:07 Post subject: Re: Minerals of DR Congo, Katanga. 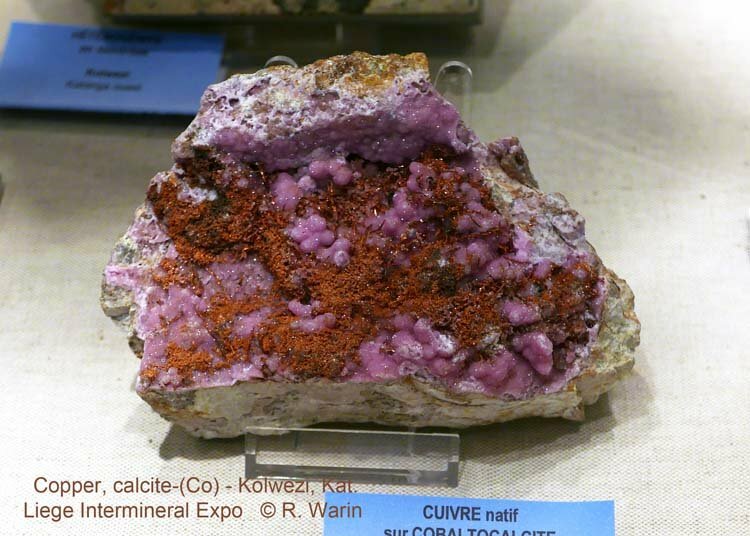 Another aspect of curienite. 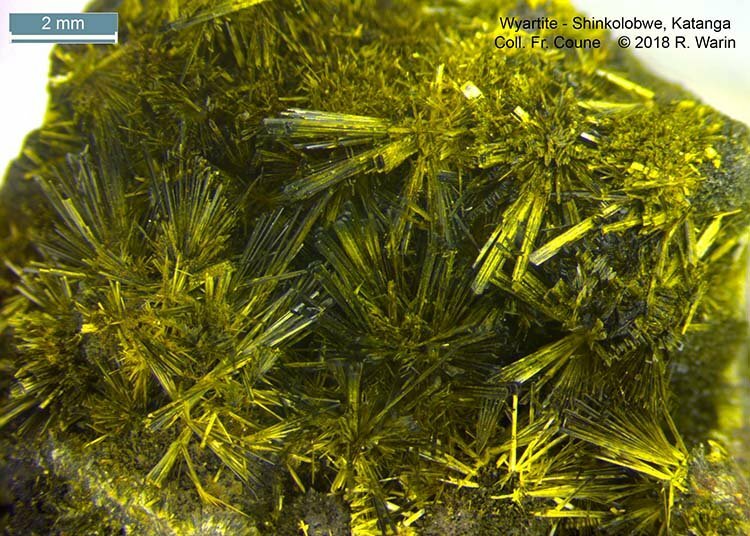 Crystals are never seen in Mounana mine. 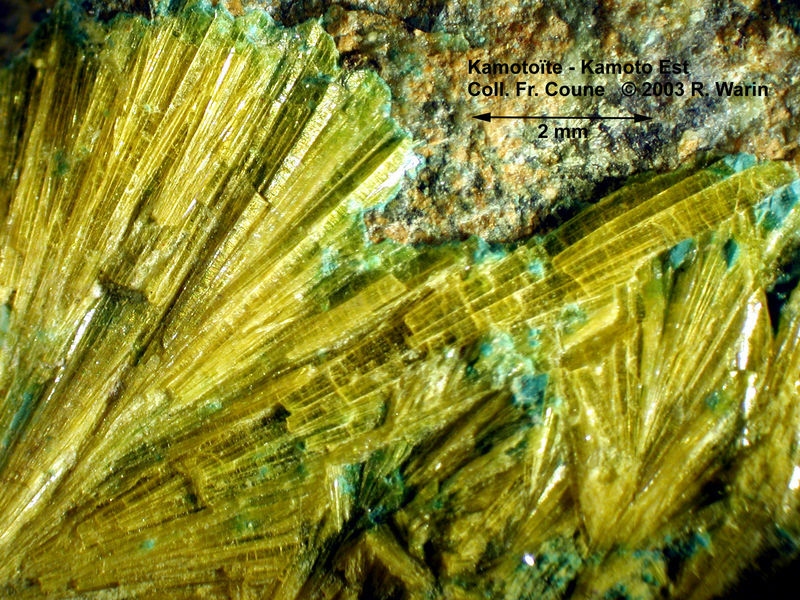 Posted: Feb 16, 2018 00:37 Post subject: Re: Minerals of DR Congo, Katanga. 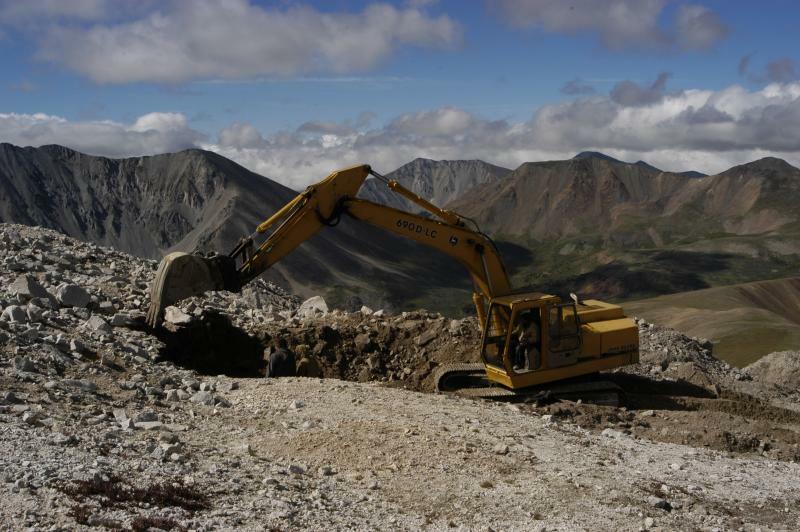 Here the expansion of the torbernites area. 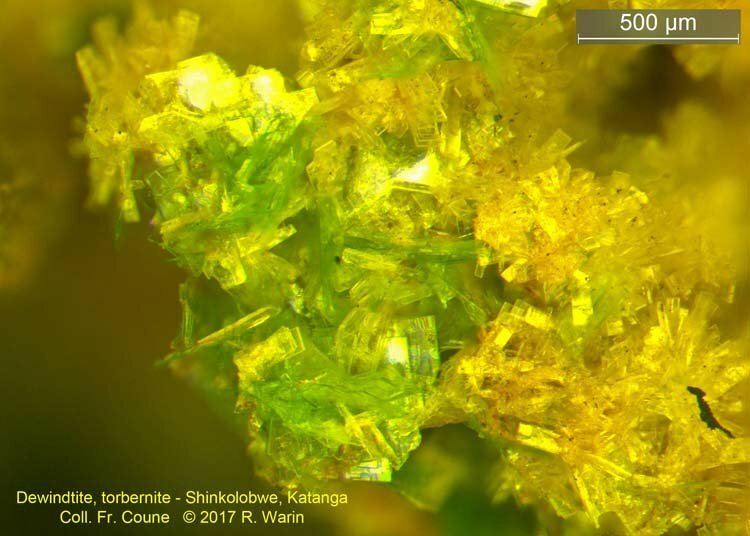 The elongation of the torbernite crystals is rather unusual. 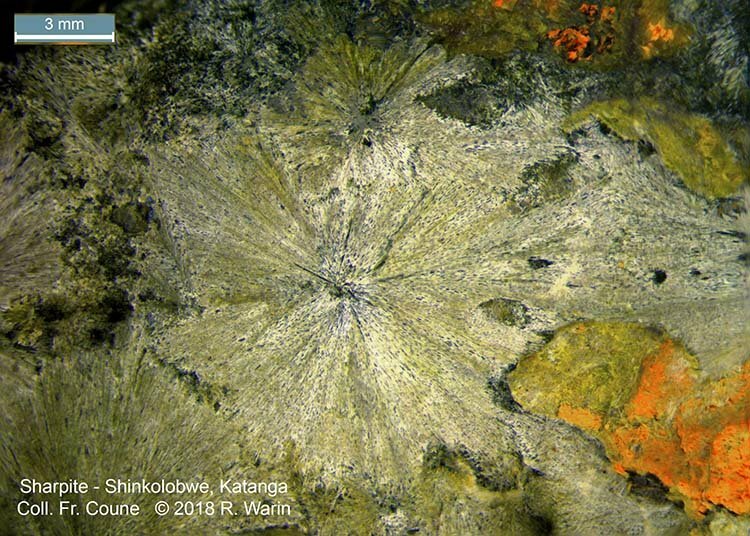 This habitus is found at Shinkolobwe. 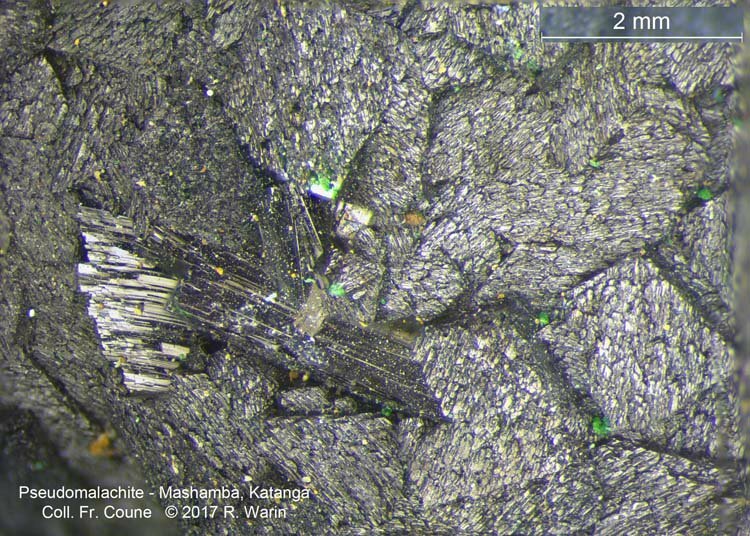 The saleeiteite can carry in Shinkolobwe an epitaxy of torbernite, but on this sample, these crystals are too small to be discerned. 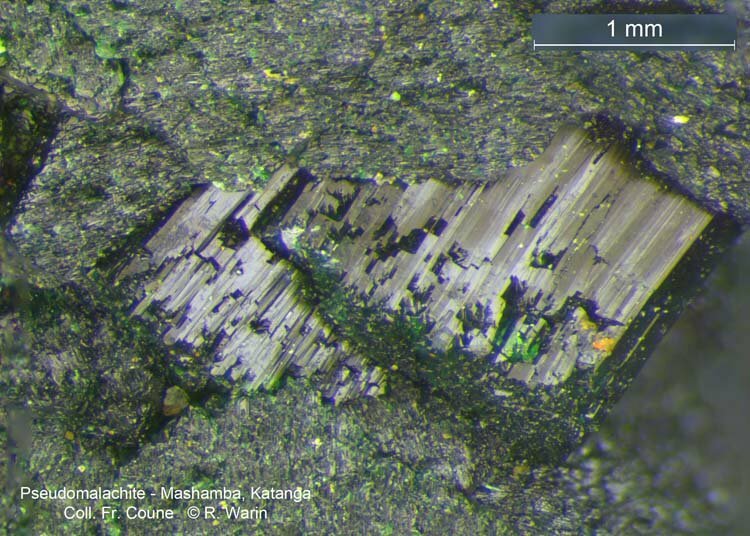 The sample size was too big for a larger magnification. 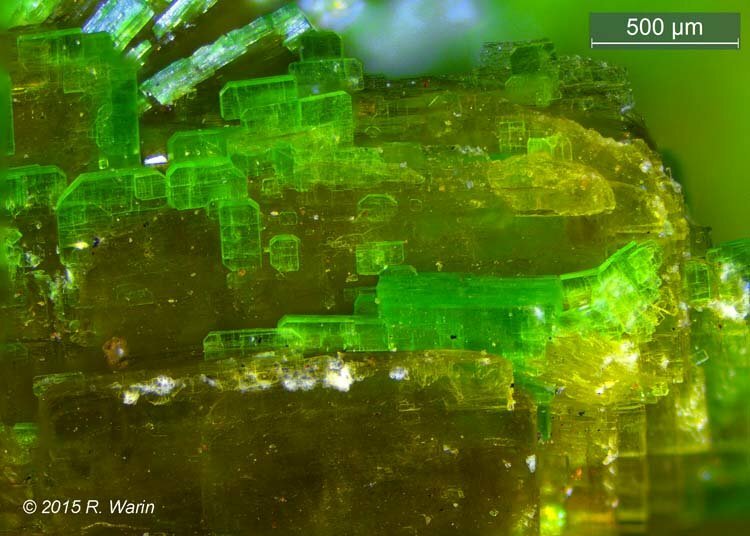 Note the unusual elongated prismatic crystallization of the torbernite crystals. 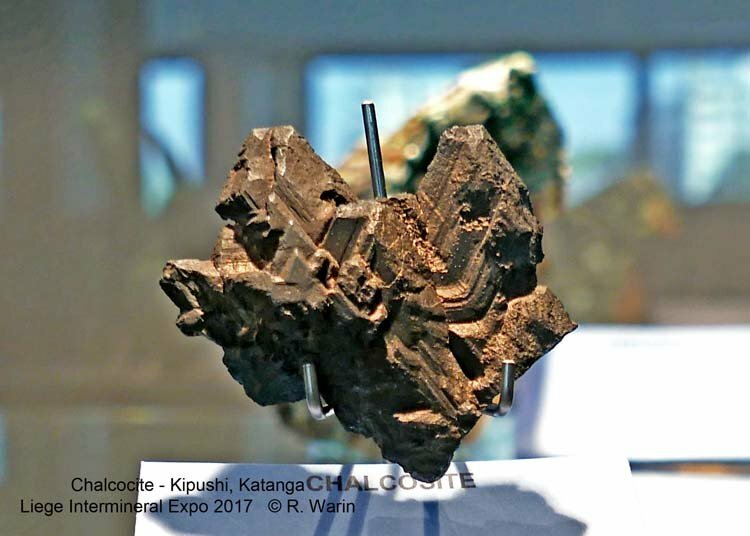 Posted: Feb 16, 2018 01:34 Post subject: Re: Minerals of DR Congo, Katanga. 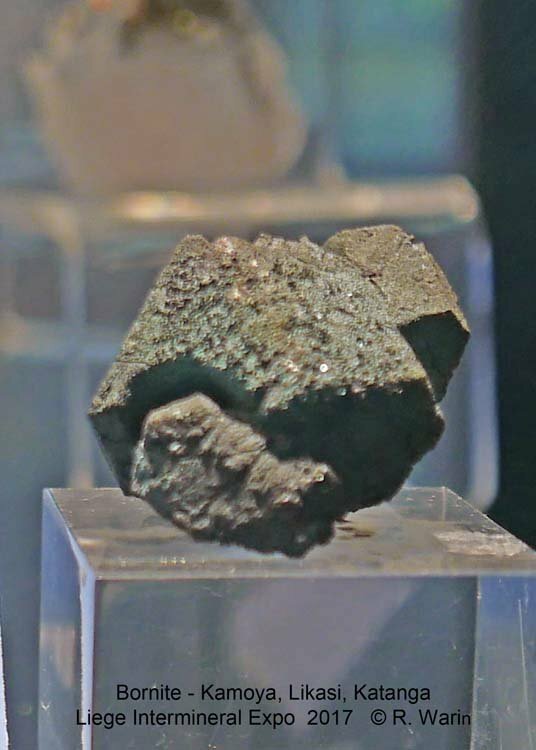 Another sample of saleeite / torbernite was photographed in 2015. 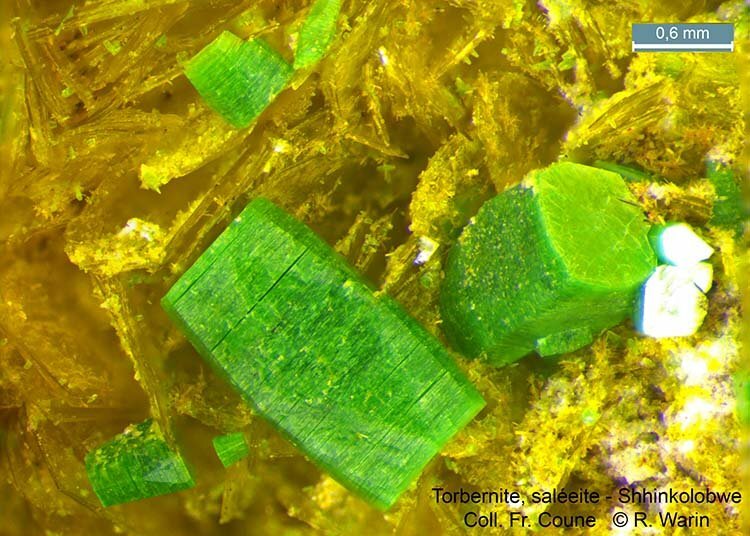 I add some photos showing the epitaxy of the torbernite on the saleeite. 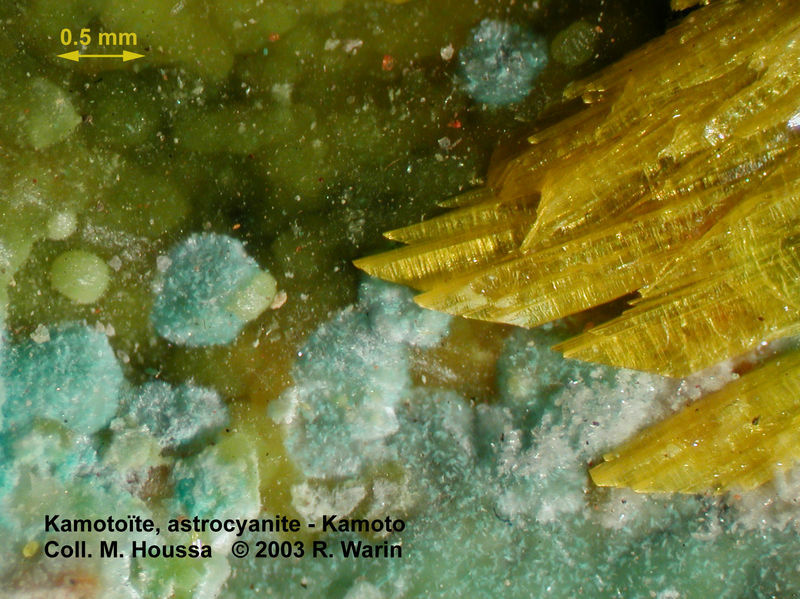 From Dal Bo Fabrice’s thesis (Mineralogy and crystal chemistry of natural and synthetic uranyl oxysalts) and Coll. S. Puccio. 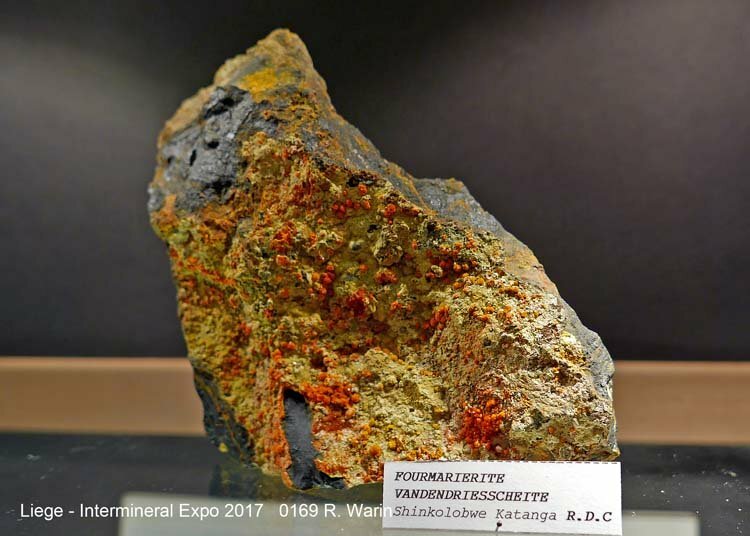 Posted: Feb 16, 2018 01:48 Post subject: Re: Minerals of DR Congo, Katanga. 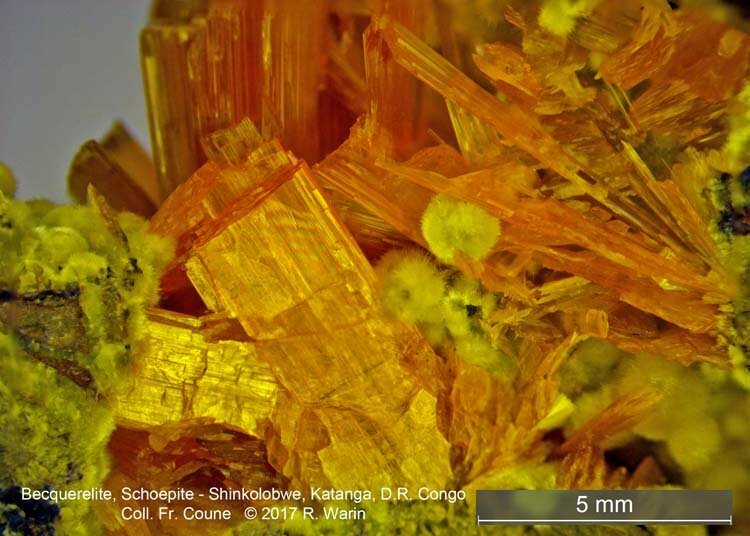 Posted: Feb 16, 2018 04:12 Post subject: Re: Minerals of DR Congo, Katanga. 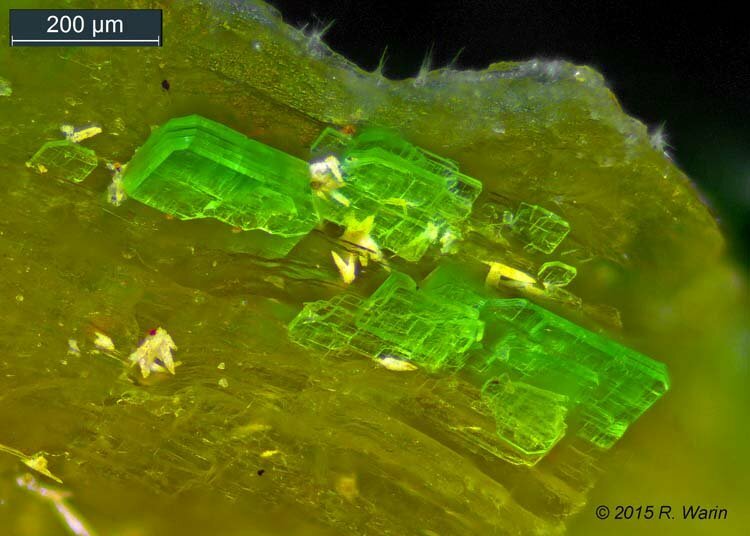 Two minerals in one Crystal ! 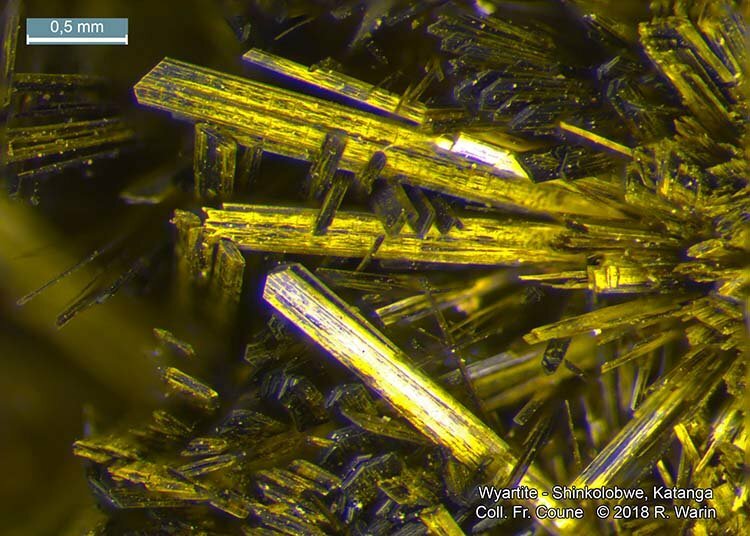 Wyartite is black-purple in color. 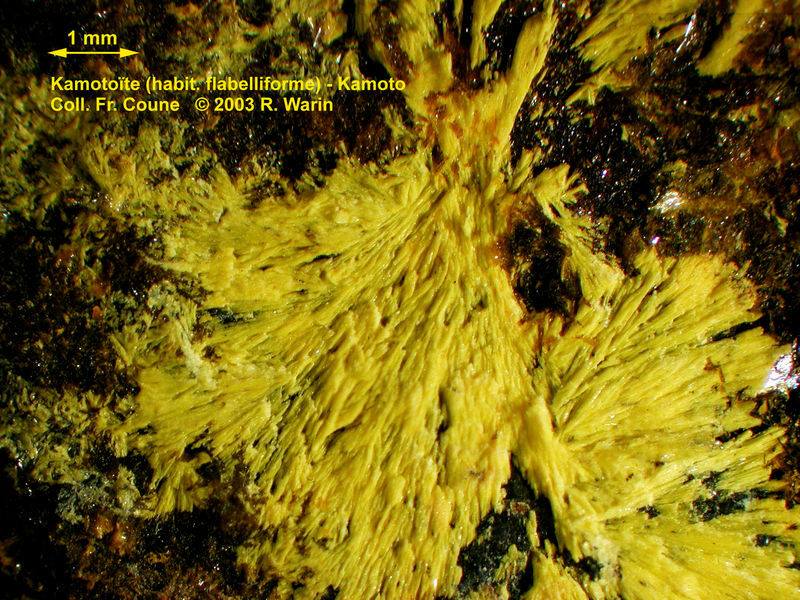 But it deteriorates superficially by decarboxylation into yellow epi-ianthinite (variety of schoepite). 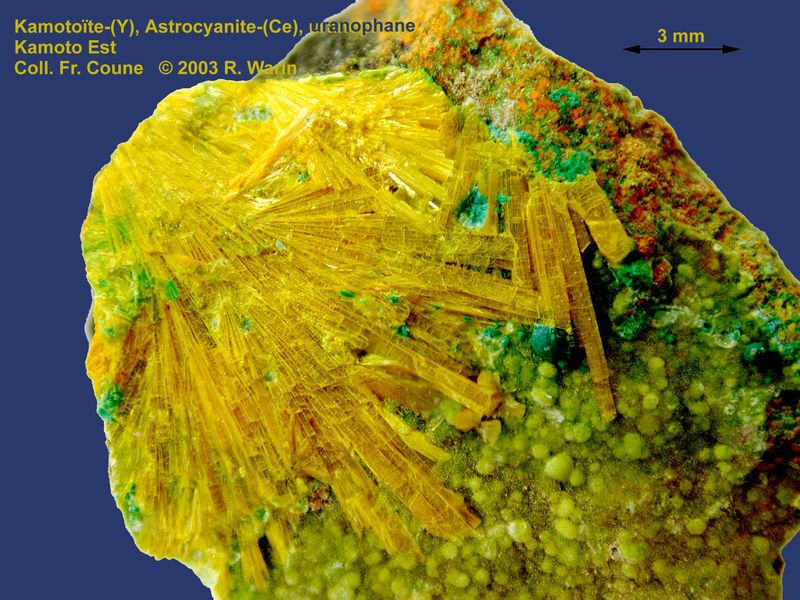 Wyartite is the hydroxy carbonate of uranyl, copper and uranium. 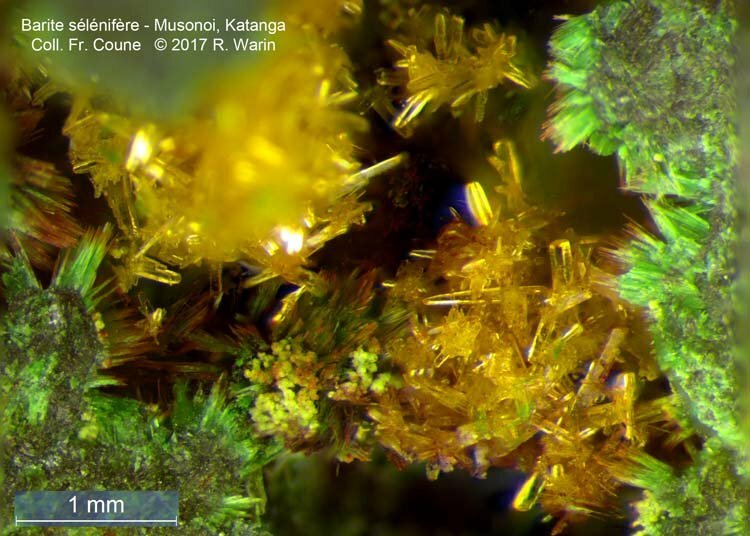 Posted: Feb 20, 2018 09:07 Post subject: Re: Minerals of DR Congo, Katanga. 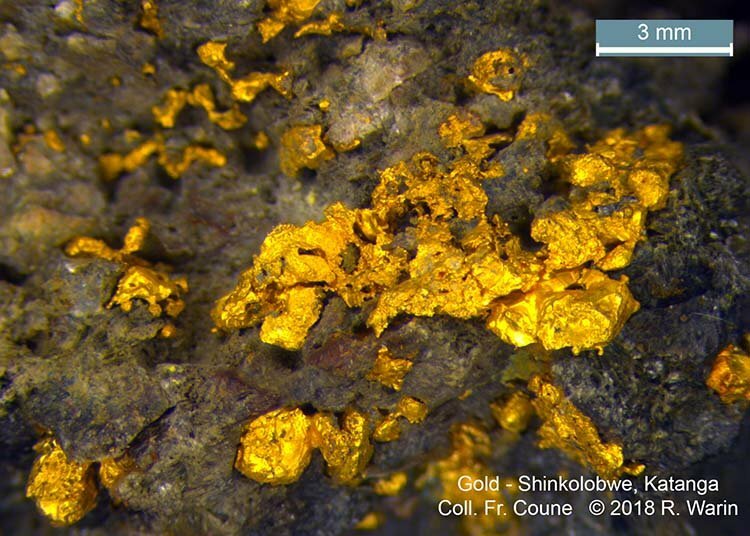 Gold on uraninite is well known in Shinkolobwe. 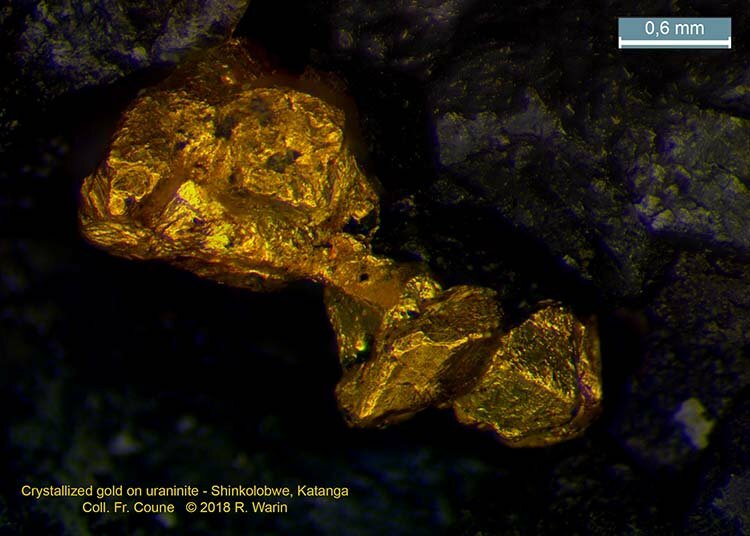 Posted: Feb 20, 2018 09:35 Post subject: Re: Minerals of DR Congo, Katanga. 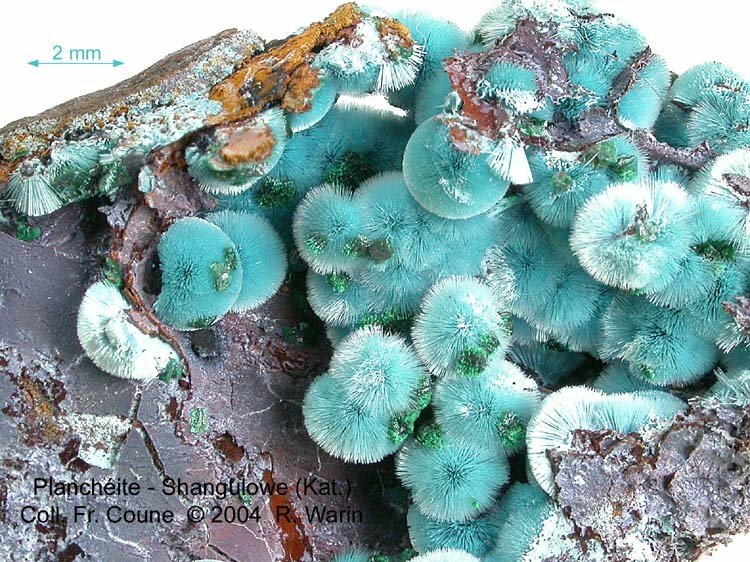 Here are extremely rare minerals. 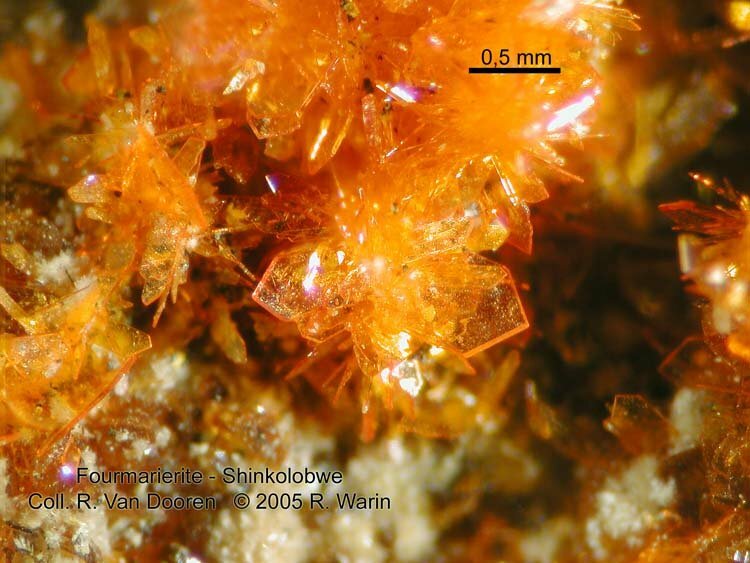 The first is kolbeckite, scandium phosphate. 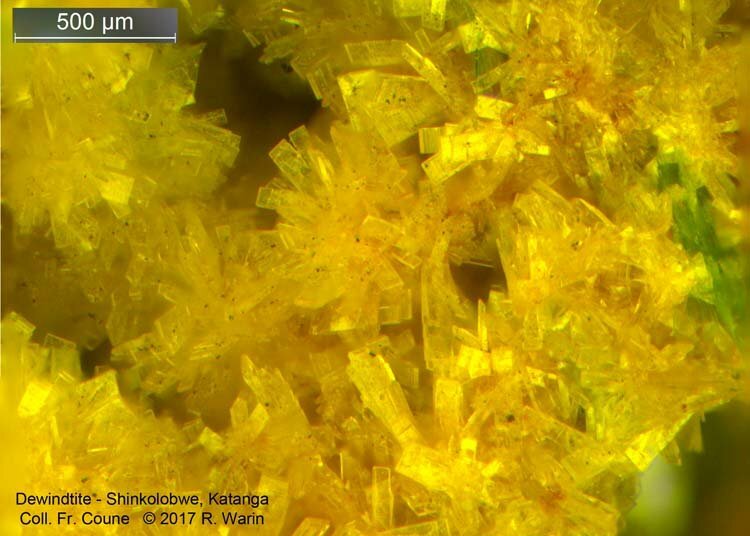 Posted: Feb 20, 2018 16:40 Post subject: Re: Minerals of DR Congo, Katanga. 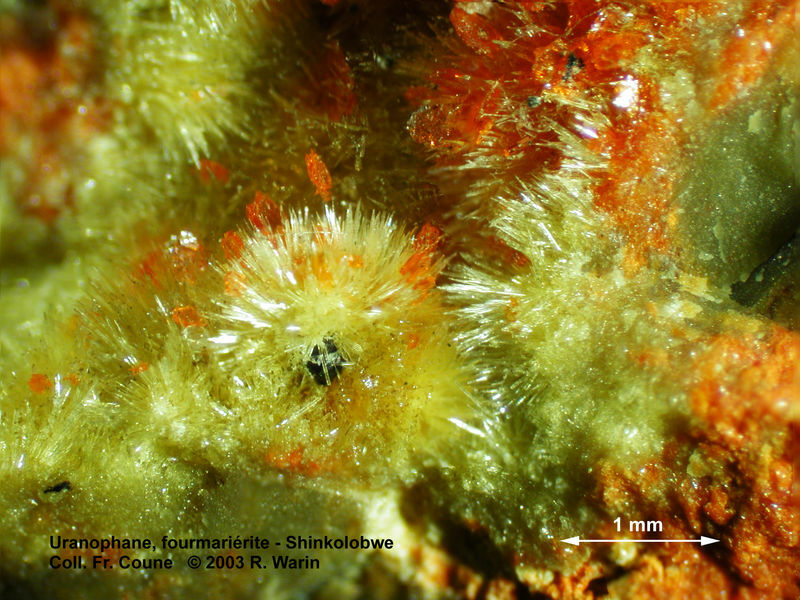 Sharpite is a rare hydroxycarbonate of uranyl and copper with radially fibrous crust.